a/ Serve as a basis for formulating and perfecting specific accounting standards and accounting regimes after uniform models. b/ Assist enterprises in making accounting entries and financial statements in a uniform manner according to the promulgated accounting standards and accounting regimes and handle matters not yet specified in order to ensure true and reasonable information in the financial statements. c/ Assist auditors and accounting controllers in giving comments on the conformity of the financial statements with the accounting standards and accounting regimes. d/ Assist users of the financial statements in understanding and evaluating financial information supplied in accordance with the accounting standards and accounting regimes. 02. The basic accounting principles and requirements as well as elements of the financial statements, which are prescribed in this standard and specified in each accounting standard must be applied to all enterprises of all economic sectors nationwide. This standard shall not replace specific accounting standards. Implementation shall be based on specific accounting standards. For cases not yet prescribed in specific accounting standards, they shall comply with the general standard. 03. All economic and financial operations of enterprises, which are related to assets, liabilities, owners’ equity, revenues, and costs must be recorded in accounting books at the time they arise, not at the time of the actual receipt or payment of cash or cash equivalents. Financial statements made on the basis of accrual shall reflect the financial status of enterprises in the past, at present and in the future. 04. 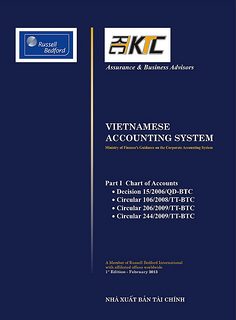 Financial statements must be made on the basis of the assumption that enterprises are operating continuously and will continue business activities normally in the near future, i.e., they have no intention or are not compelled to cease operation or to substantially downscale their operation. Where reality differs from the continuous operation assumption, the financial statements must be made on another basis, which must be explained. 05. Assets must be recognized according to their historical cost. The historical cost of an asset shall be calculated according to the cash amount or cash equivalent already paid or to be paid, or according to the reasonable value of the asset at the time the asset is recognized. The assets’ historical costs must not be modified except otherwise prescribed in specific accounting standards . 06. The recognition of revenues and that of costs must match. When a revenues is recognized, a corresponding cost related to the creation of such revenue must be recognized. Costs corresponding to revenues include costs of the period in which revenues are created and costs of the previous periods or payable costs related to the revenues of such period. 07. The accounting policies and methods selected by enterprises must be applied consistently within at least one accounting year. Where appear changes in the selected accounting policies or methods, the reasons for and impacts of such changes must be presented in the explanations of financial statements. d/ Revenues and incomes shall be recognized only when there are solid evidences of the possibility of obtaining economic benefits, while costs must be recognized when there are evidences of the possibility of arising costs. 09. Information shall be considered material in cases where the insufficiency or inaccuracy of such information may distort significantly the financial statements, thus affecting the economic decisions of the users of the financial statements. Materiality depends on the amount and nature of information or errors assessed in particular circumstances. The materiality of information must be examined both quantitatively and qualitatively. 10. Accounting information and data must be recorded and reported on the basis of adequate and objective evidences and true to the actual situation, content, nature and values of arising economic operations. 11. Accounting information and data must be recorded and reported according to reality, not be distorted nor falsified. 12. All arising economic and financial operations related to the accounting period must be recorded and reported in full, not be omitted. 13. Accounting information and data must be recorded and reported in time, according to or ahead of prescribed schedule, without delay. 14. Accounting information and data presented in the financial statements must be explicit and easily understandable to users. Users mean people with average knowledge about business, economics, finance and accounting. Information on complicated matters in the financial statements must be expounded in the explanation part. 15. Accounting information and data of different accounting periods of an enterprise and of different enterprises may be comparable only when they are calculated and presented in an uniform way. In case of lack of uniformity, expositions must be given in the explanation part so that the users of the financial statements may compare information of different accounting periods, different enterprises, or between execution information and projected or planned information. 16. The accounting requirements mentioned in paragraphs 10, 11, 12, 13, 14 and 15 above must be satisfied simultaneously. For example: The honesty requirement also embraces the objectivity, timeliness, fullness, understandability and comparability requirements. 17. The financial statements reflect the financial status of enterprises through summing up economic and financial operations of the same economic nature in their elements. The elements directly related to the determination of the financial status in the balance sheets include assets, liabilities and owners’ equity. The elements directly related to the assessment of the business situation and results in the statements on business results are revenues, other incomes, costs and business results. a/ Assets mean resources that are controlled by enterprises and may yield future economic benefits. b/ Liabilities mean the current obligations of an enterprise, arising from the past transactions and events, which must be settled by the enterprise with its own resources. c/ Owners’ equity means the value of the enterprises’ capital, being equal to the difference between the value of the enterprise’s assets minus (-) its liabilities. 19. When determining the items in the elements of a financial statement, attention must be paid to their ownership forms and economic contents. In some cases, though assets do not fall under the enterprises’ ownership, they are still reflected in the elements of the financial statements due to their economic contents. For example, in case of financial leases, the economic form and content are that the lessee-enterprises obtain economic benefits from the use of leased assets during most of the useful life of the assets; in return the lessee-enterprises are obliged to pay a sum that approximates the reasonable value of the assets as well as related financial costs. The financial leasing operation gives rise to the item "Assets" and the item "Liabilities" in the balance sheets of the lessee-enterprises. 20. Future economic benefits of an asset are the potential to increase the sources of cash and cash equivalents of an enterprise or to reduce cash amounts to be paid by the enterprise. d/ For distribution to the enterprise’s owners. 22. Assets may have the physical form such as workshops, machinery, equipment, supplies, goods or the non-physical form, such as copyright or patents but must gain future economic benefits and are under the control of enterprises. 23. Assets of enterprises also include assets that enterprises do not own but can control them and gain future economic benefits therefrom, such as assets given for financial leases; or assets that enterprise own and can gain future economic benefits therefrom but may not control them legally, such as technical know-hows obtained from development activities, which may satisfy the conditions required in the asset definition when they are still kept secret and enterprises can still gain economic benefits therefrom. 24. Assets of enterprises are formed from the past transactions or events, such as capital contribution, procurement, self-production, grants or donations. Transactions or events expected to arise in future will not lead to an increase in assets. 25. Normally, when costs are incurred, they will create assets. Costs which do not bring about future economic benefits will not create assets; or in other cases, no costs are incurred but assets are still created, such as contributed capital, allocated or donated assets. 26. Liabilities determine the current obligations of an enterprise when it receives an asset, participates in a commitment or is bound to legal obligations. e/ Conversion of the liability obligation into owners’ equity. 28. Liabilities arise from past transactions and events, such as purchase of goods without payment, use of services without payment, borrowing, to merchandise warranty commitment, contractual obligation commitment, payables to employees, remittable taxes, and other payables. 29. Owners’ equity is reflected in the balance sheets, including investors’ capital, equity surplus, retained profits, funds, undistributed profits, exchange rate differences and differences from asset revaluation. a/ Investors’ capital may be enterprise owners’ capital, contributed capital, equities, and the State’s capital. + Exchange rate difference arising when enterprises in the country include the financial statements of their activities carried out abroad using accounting currency other than the accounting currency of the reporting enterprises. g/ Difference from the asset revaluation is the difference between the book value of assets and the revalued value of assets under the State’s decisions, or when assets are contributed as joint-venture capital or shares. 30. Profits are used as a measure of the business results of enterprises. The elements directly related to the profit determination are revenues, other incomes and costs. Revenues, other incomes, costs and profits are criteria reflecting the business situation of enterprises. a/ Revenues and other incomes: are the total value of economic benefits earned by an enterprise in the accounting period, arising from the enterprise’s normal production, business and other operations, contributing to increasing the owners’ equity, excluding capital contributions made by shareholders or owners. b/ Costs are the total value of amounts which reduce economic benefits in the accounting period in the forms of amounts spent, asset depreciation amounts, or give rise to liabilities leading to a decrease in the owners’ equity, excluding amounts distributed to shareholders or owners. 32. Revenues, other incomes and costs are presented in the reports on business results so as to supply information in service of the assessment of the enterprises’ capability to create cash sources and cash equivalents in the future. 33. The elements of revenues, other incomes and costs may be presented in many ways in the reports on business results so as to describe the business situation of enterprises, such as revenues, costs and profits of normal business and other operations. 36. Costs include production and business costs arising in the process of normal business operations of enterprises, and other costs. 37. Production and business costs arising in the process of normal business operations of enterprises, such as cost of goods sold, sale costs. enterprise management costs, costs for loan interests, and costs related to letting other parties use assets with yields, royalties… These costs arise in the form of cash and cash equivalents, inventories, machinery and equipment depreciation. 38. Other costs include costs other than production and business costs arising in the process of normal business operations, such as costs for liquidation and sale of fixed assets, fines imposed by customers for contract breaches, etc. b/ Such item has some value which can be determined in a reliable manner. 40. Assets will be recognized in the balance sheets when enterprises are certain to gain future economic benefits therefrom and the value of such assets are determined in a reliable way. 41. Assets will not be recognized in the balance sheets when costs incurred are not certain to yield future economic benefits for enterprises and these costs will be recognized in the reports on business results as soon as they arise. 42. Liabilities will be recognized in the balance sheets when there are adequate conditions to ascertain that enterprises will have to spend a cash amount on the current obligations they have to pay for, and such liabilities must be determined in a reliable way. 43. Revenues and other incomes will be recognized in the reports on business results when they gain future economic benefits related to the increase in assets or decrease in liabilities, and such increased value must be determined in a reliable way. 44. Production, business and other costs will be recognized in the reports on business results when these costs reduce future economic benefits related to the decrease in assets or increase in liabilities, and these costs must be determined in a reliable way. 45. Costs recognized in the reports on business results must comply with the principle of matching between revenues and cost. 46. When economic benefits expected to be obtained over many accounting periods are related to revenues and other incomes which are determined indirectly, the related costs will be recognized in the reports on business results on the basis of systematic or proportional amortization. 47. A cost will be immediately recognized in the reports on business results in the period if it fails to bring about economic benefits in subsequent periods.